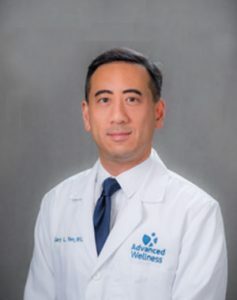 Dr. Gary L. Yen is Board certified in Physical Medicine and Rehabilitation and has a sub-specialty in Pain Medicine. Dr. Yen grew up in Long Island, NY and received his medical degree from Ross University. He completed his internship in Internal Medicine at Lutheran Medical Center in Brooklyn, NY and performed his residency in Physical Medicine and Rehabilitation at Stony Brook University, where he was chief resident. Dr. Yen completed a pain management fellowship at RehabNY in Buffalo, NY, during which he served as the assistant athletic trainer to the Buffalo Bison, the Minor League AAA baseball team for the Cleveland Indians, as well as the Niagara University men’s and women’s collegiate hockey team. The former chairman of the Physical Medicine & Rehabilitation Division of the Pain Management Department at CentraState Medical Center, Dr. Yen specializes in the non-operative treatment of a variety of joint, muscular, nerve, skeletal, spine and sports related injuries. He treats acute and chronic pain syndromes and performs electrodiagnostic studies. Dr. Yen also performs variety of interventional pain procedures and minimally invasive spine surgery for the relief of pain. He utilizes conservative treatments such as physical therapy, chiropractic care and acupuncture in conjunction with other procedures to enhance long term benefits. Dr. Yen believes in working with patients to create individual treatment plans. When not attending to his patients, Dr. Yen likes to play golf, cook, and has a passion for playing the saxophone and piano. He is the proud father of two boys.